Yesterday I learned that the Kit Kat Toffee Treat four finger bar was significantly different to the Kit Kat multiple pack Toffee Treat two finger bars. It's a strange concept and I had a thought that I should go and pick one up to investigate the difference between the different sized chocolates. By a slightly strange coincidence at work today one of the lads went out to get his lunch and ended up buying several of the Kit Kat Toffee Treat (four finger) bars in order to get his lunch above the prerequisite £10 to pay by card. He actually hadn’t realised he’d picked up a limited edition and was a bit disappointed that he had. I was a benefit of this, and greedily snapped one up. The four finger bar is different to the multipack two finger version in that the toffee coating covers the entire bar, there is no chocolate on this version, just pure toffee coating. This made it remarkably similar to the Caramac Kit Kat of old, previously available as a multipack bar two finger. 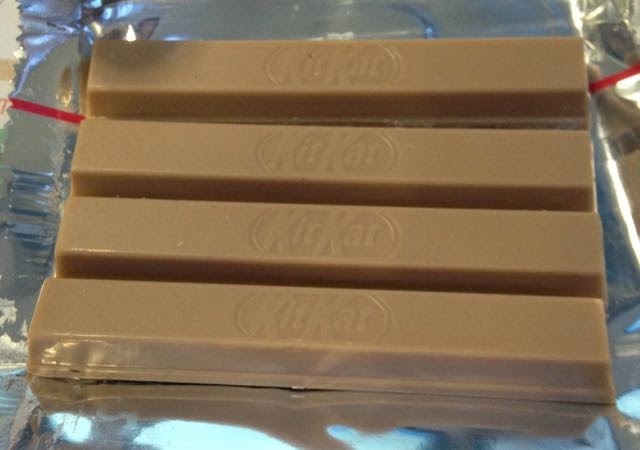 The Caramac Kit Kat was a much loved bar, but one for those with a sweet tooth, as is this. This four finger Toffee Treat is a very sugary tasting bar, and I felt this would have actually worked better as two finger multipack edition as the sweetness overload from two fingers was plenty. Likewise the toffee chocolate edition that was a two finger bar would work better as a four finger bar as the chocolate taste made it more tolerable. Geez this is all getting a bit confusing, and it is bizarre that there are differences between the two bars when they are both officially called the same thing. Anyway I wonder how many more version of caramel / toffee etc Kit Kat have up their sleeves for us? The review of the other Toffee Treat two finger multipack edition can be found: here.